The post WW II C&O had a large footprint in Columbus. In mid-Twentieth Century it was made up of two distinct railroads. The line from Huntington, WV to Toledo through Columbus was a high capacity double track main line with The Sportsman, a crack passenger train, and heavy coal and merchandise traffic. The Hocking Division from Columbus to the southeastern Ohio coal fields was a secondary line. The locomotives assigned to these two distinct railroad lines reflected these differences from the large Allegheny 2-6-6-6 locomotives on the mainline to the 4-6-0 used on the passenger train to Pomeroy. A large rail yard along Parsons Avenue in south Columbus had a round house and locomotive servicing facilities. There were also the remnants of the Mound Street Yard, the predecessor to Parsons Yard and the smaller Yard “A”, a coach and staging yard for the freight house and many industries served by the C&O in Columbus. Following are descriptions of the steam locomotives seen in post-World War II Columbus until steam abruptly ended in early 1953. C-3 – 0-6-0 - No. 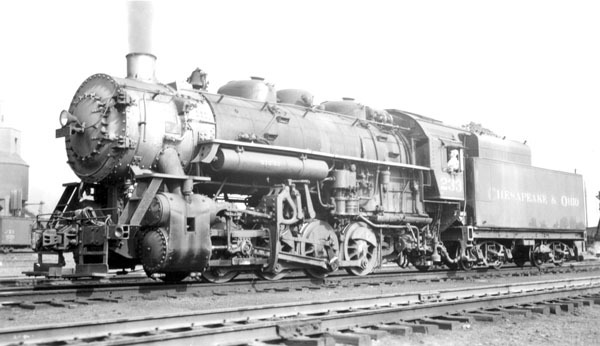 15 was one of a kind that shared class C-3 with two 1883 0-6-0's that were scrapped shortly after No. 15 was built. No. 15 was used for switching industrial districts out of Parson Yard. No. 15 at Parsons Yard, July 1946. Photo from the Alex Campbell Collection. 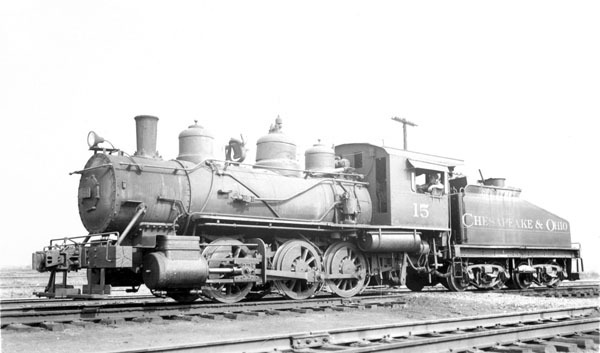 C-14, C-16 – 0-8-0 - locomotives were used extensively for switching and transfer duties in Columbus. Nos. 255-284 were built in 1948 shortly before the C&O decision to convert to diesel. These 30 new switchers were sold to the Norfolk & Western. 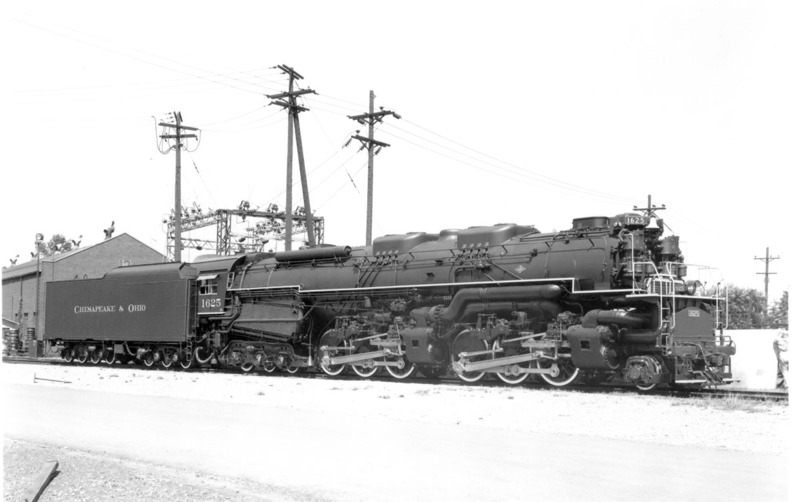 The N&W liked them so well they copied the design building additional switchers up to 1953. No. 233 at Parsons Yard, July 1946. Photo from the Alex Campbell Collection. G-3, G-4 – 2-8-0 – The G-3 and G-4 Consolidations were originally Hocking Valley locomotives. When the C&O purchased the Hocking Valley they retained their original numbers and most were assigned to the Hocking Division from Columbus to the southeastern coalfields. They were used on the mine runs as well as freight trains to Columbus. The G-3 lasted until 1949 and the G-4 to 1951. The C&O owned more Consolidations than any other class of locomotive. At first they were used as road locomotives on freight trains. As newer and larger locomotives were acquired the older 2-8-0s were relegated to switch and local service. Builder's photo of Consolidation No. 168 from the Edward H. Miller Collection. No. 168 was built for the Hocking Valley Railway in 1910. 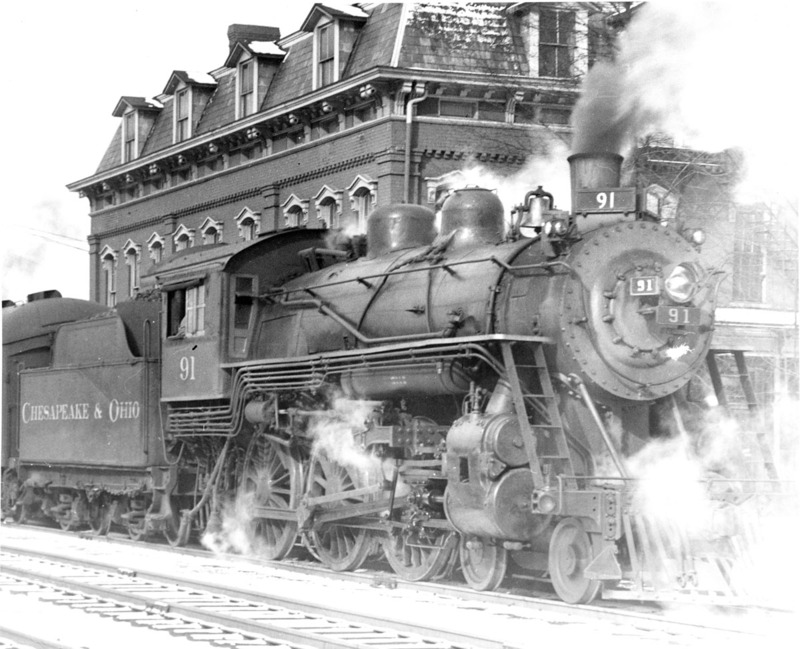 K-4 - 2-8-4 – The C&O Kanawha class locomotives were used in Columbus for merchandise trains and helpers on Powell Hill. In other C&O territory they even saw service on passenger trains. 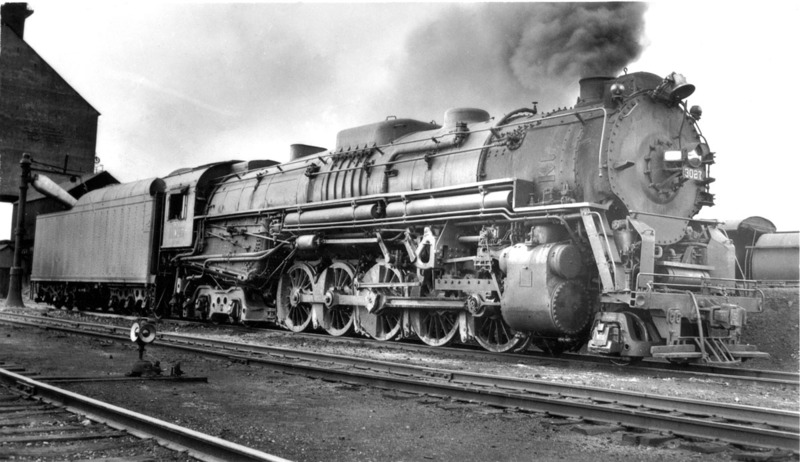 Most railroads referred to 2-8-4’s as Berkshires, the C&O named the class after the Kanawha River. No. 2717 at Parsons Yard July, 1946. Photo from the Alex Campbell Collection. 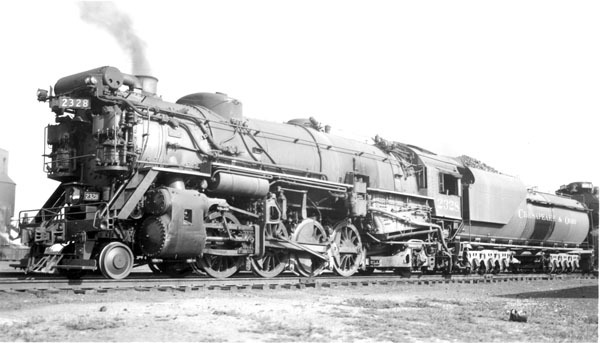 T-1 - 2-10-4 - The T-1 was one of the most powerful two cylinder locomotives ever built. They were constructed in 1930 specifically for the Russell, KY – Toledo coal traffic. It could handle 160 car, 13,500 ton coal trains with help needed only at the Ohio River Bridge and on the 23 mile long Powell Hill north of Columbus. 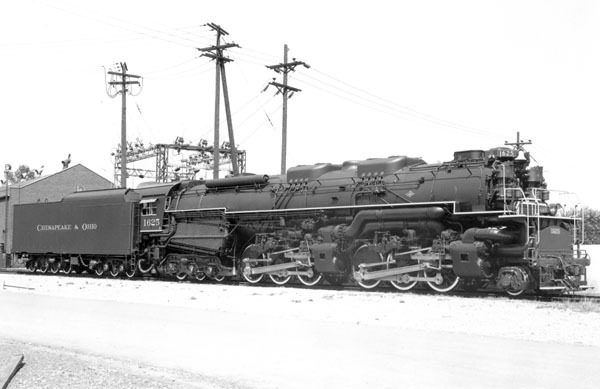 They served for 20 years until the end of steam supplemented in the late 1940s with the H-8 Alleghenies. No. 3027 at Parsons Yard April, 1938. Photo from the Gary D. Rolih Collection. H-8 - 2-6-6-6 – The Allegheny class locomotive belongs to the group of four largest locomotives ever built in the U.S. (The group includes Union Pacific, 4-8-8-4, “Big Boy”; Norfolk & Western Y-6b, 2-8-8-2 and Duluth, Missabe & Iron Range, 2-8-8-4, “Yellowstone”.) 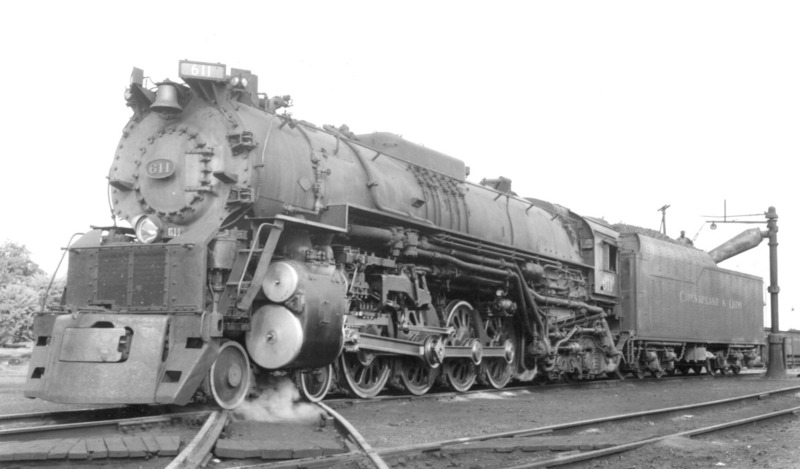 The Allegheny was built for the mountains between Hinton, WV and Clifton Forge, VA. After 1948 they were also employed through Columbus supplementing the T-1. It was not uncommon to have an H-8 and T-1 paired on Powell Hill. Builder's photo of No. 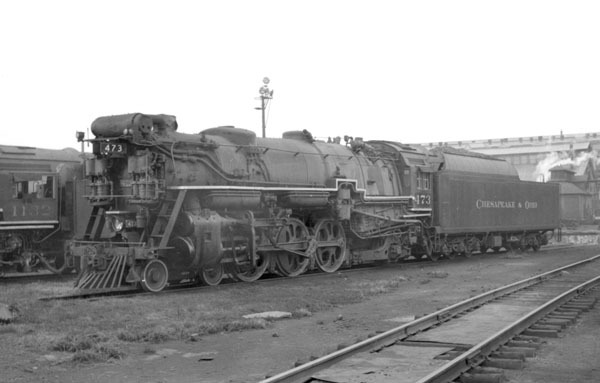 1625 at the Lima Locomotive Works, 1944. Photo from the Jay Williams Collection. F-13 - 4-6-0 – The C&O’s four F-13 class Twelve Wheelers were built for the Hocking Valley Railway. Three lasted until the late 1940s serving on the Hocking Division passenger trains from Columbus to Athens and Pomeroy. They were replaced by 4-6-2 Pacific locomotives one year before the Hocking Division passenger service was abandoned. No. 91 at the Logan Depot Hotel. Photo from the Donald A. Kaiser Collection. F-12, F-15, F-16, F-17, F19 - 4-6-2 – Two F-15 class Pacific locomotives were asssigned to the Hocking Division passenger trains the last year of their service which ended December, 1949. F-17 class Pacific locomotives were use post WW II on the Detroit-Toledo-Columbus passenger train. Trains 35 and 36 had their last trip January 19, 1952. The premier Sportsman Detroit-Toledo-Columbus-Norfolk, VA train was usually assigned a Hudson until it was dieselized around 1952. Class F-17 No. 473 at Huntington, WV, September, 1951. Photo by Donald A. Kaiser. J-1, J-2 - 4-8-2 – The Mountain class and Greenbrier that follows were designed for taking heavy passenger trains over the Allegheny Mountain grades. As such it would have been unusual to see them in Columbus although there is photo evidence that they did reach Columbus. They could have been used on fast merchandise trains, troop trains and even as helpers on Powell Hill. 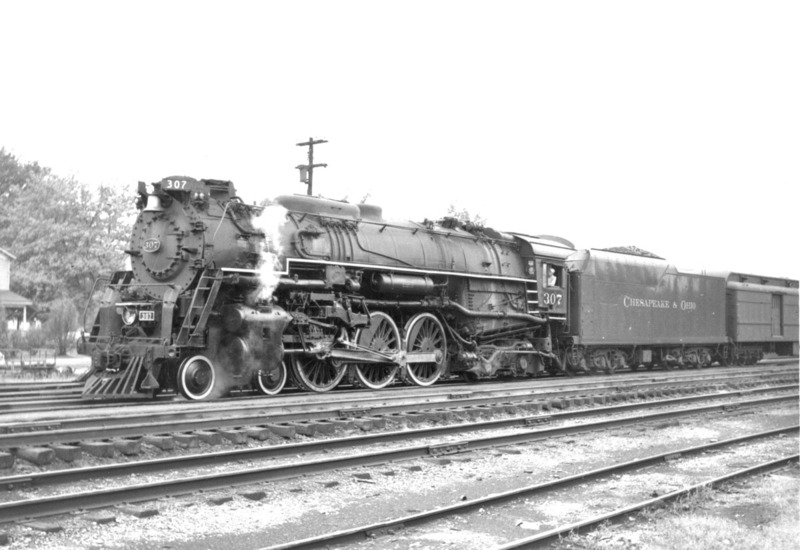 It would have been a lucky railfan that caught a photo of a 4-8-2 or 4-8-4 locomotive at Columbus. J-1 No. 542 next to the Mound Street engine house, July, 1933. Photo from the Alex Campbell Collection. J-3 - 4-8-4 – Passenger locomotives. See Mountain class locomotive introduction above. J-3a No. 611 at Parsons Yard, September, 1947. Photo from the Alex Campbell Collection. L-1, L-2, L-2a - 4-6-4 – Passenger Locomotives. 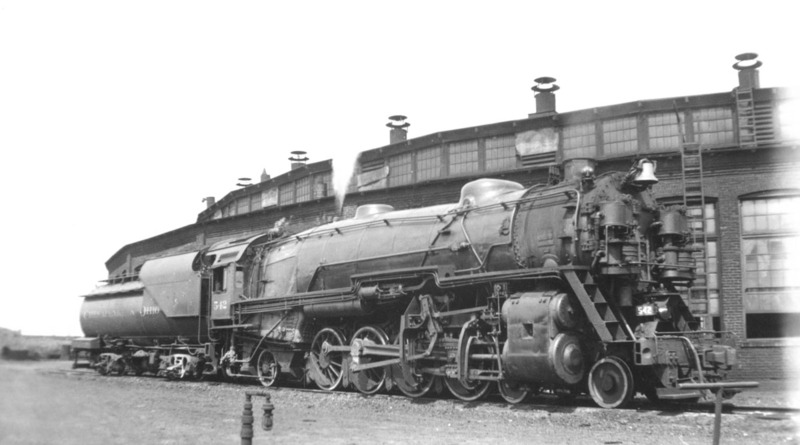 The Hudson class locomotives were designed for the low grade portion of the C&O. They were a step up from the Pacific class and were needed as trains got heavier during WW II. They were often found assigned to the The Sportsman. 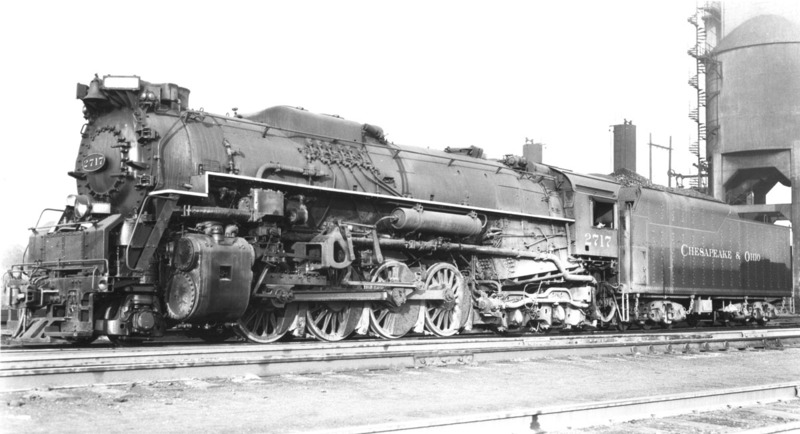 The five L-1 Hudson class locomotives were built by the C&O from F-19 Pacific class locomotives. L-2 No. 307 at St. Albans, WV, September 1951. Photo by Donald A. Kaiser.